Have you been to a Knoxville farmers market this spring? I visited the one at the Laurel Church of Christ on Kingston Pike yesterday. It is open on Tuesday and Friday from 3:00 - 6:00 pm. 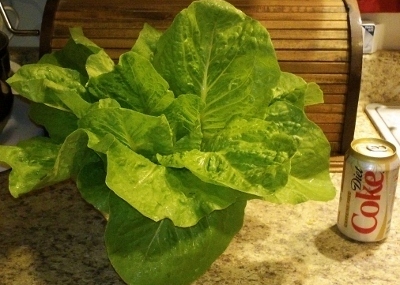 The unseasonably warm temperatures are making produce ready to harvest a little earlier than usual. The Knoxville farmers market we visited was full of straight from the garden goodness. There were plenty of juicy ripe strawberries available yesterday and rhubarb to go along with the berries. Several booths had garlic, carrots and radishes. At least two vendors had vegetable and other garden plants available. If you like fresh eggs, artisan baked bread or cheeses, then you won't be disappointed. I picked up two of the largest heads of lettuce at the farmers market that I have just about ever seen! Given the size the $3.00 price tag made each of them a bargain. We put a can of soda by them so the photos could better give a sense of scale. Pints of strawberries were going fast at $4.00 each and the tomato plant was only $1.50. Farmers markets in Knoxville can hold bargains and are fun to visit. Bring a reusable tote or other sturdy bag. You will want lots of space so you can carry all the goodies home with you. Market Square Mall will have a 'mini-market' set up during the Rossini Festival. Look for other markets in Farragut and scattered about town. This Examiner series has the inside scoop on the locations. 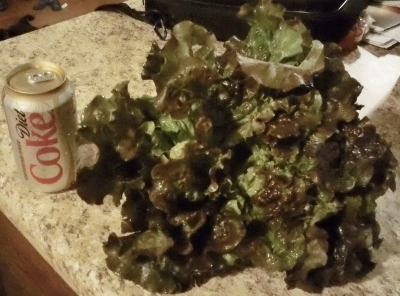 You may not find heads of lettuce that are this big at every farmers market in Knoxville, but it's a safe bet that you won't walk away empty handed.